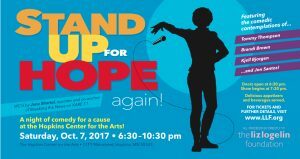 2nd Annual Stand Up For Hope! 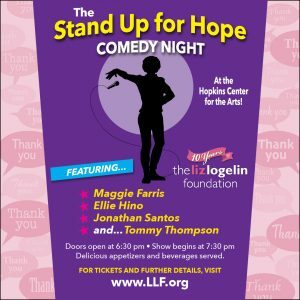 Stand Up for Hope to benefit The Liz Logelin Foundation is back again with an amazing line up! Join us on October 7th, 2017 at 6:30 pm for games, a raffle and a gut – busting night of stand up comedy. Performances by local comedians Tommy Thompson, Brandi Brown, Kjell Bjorgen and Jon Santos and MC’D by Jana Shortal, reporter and co-anchor of Breaking the News on KARE 11! 2016 Stand Up For Hope! After David’s wife Sandy was diagnosed with a terminal brain tumor in 2010, she began to go downhill quickly. She lost her ability to walk without a cane, and wasn’t able to go up and down stairs without a lot of difficulty. Her bedroom had been upstairs, so David had to move quickly to find her a new place to sleep– a room by the back deck was quickly remodeled for her. It was also where Sandy spent the last six weeks of her life, and the site of unimaginable pain for David and his children. After Sandy’s death, David struggled to find his way forward with his two daughters, Isabel and Maddy. In the devastating wake of losing their mother and wife, the Rivera family tried to push forward as best they could. Sandy had some life insurance that kept them afloat for a while, and the girls kept busy with activities at school. Unable to go back to work, David struggled with their finances until one day he googled “widowed fathers” and stumbled upon the Liz Logelin Foundation. He applied for and received a grant. After learning about the origins of the foundation, he got in touch with Matt Logelin, and they shared stories. He says he is reading Matt’s book, but it has felt “too painful” to finish right now.For David, finding the Liz Logelin Foundation wasn’t just about money- it was a way to connect with others; a way to know that he wasn’t alone. Since then, David says he’s thought a lot about how to use the money in the most meaningful way possible to honor his wife. Time and time again, he has looked at his young daughters and tried to think of what would be best for them. Finally, he realized that a meaningful project was right in front of him- he wants to use the money from the foundation to remodel the room his wife spent her last days in. Since her passing, he says that the family barely ever goes in the room, and when they do, it’s just to pass quickly through on their way outside. For his two daughters, who have been to camps and counseling, there is real value in being able to find some stability and fun where there has been so much pain. David wants to remodel the room how they’d like it, so it’s a place where they can hang out and have fun as they enter their teenage years. “In many ways, they just want to be normal again. This could be a part of that,” he says. Even with all the suffering they have experienced, with help from the foundation and the hard work of one very brave family, there’s a chance that this room might be the sunniest room in the Rivera house yet again. Please help families like David’s rebuild hope by donating now. Join the $7 on the 7th campaign and help us continue to change lives all year round. Your support of $7 a month provides the LLF the opportunity to change lives. Donate now and help spread hope! David’s story was written by Rachel Nelson who lives and writes in Minneapolis. After the unexpected and shocking murder of her husband Germaine last summer, it took all the strength Samira had just to keep herself and her two young daughters going. Unable to find any organizations that could help and uncertain what to do, she googled “help for widows” in a moment of desperation. One of the first hits was the Liz Logelin Foundation. Finally, she had found a source of relief. The first thing Samira will do with a grant from the foundation is get back on top of her household bills. Things have gotten so bad that when her car got a flat tire, she had to start walking and taking the bus rather than pay to get it fixed. Once these basic needs are met, Samira would love to do something special for her daughters. Both of their birthdays are in the early summer, right before the first anniversary of their father’s passing. It’s going to be a delicate and emotional time for the family. Even with the incredible suffering her family has endured, Samira has a lot of hope for the future. Hope is what lets Samira and her beautiful family keep surviving, and hope is what you give when you donate to the Liz Logelin Foundation. Donate now, and help spread hope! Samira’s story was written by Rachel Nelson who lives and writes in Minneapolis. The first Bowl for Hope in LA was a huge success! Thanks to your generosity we raised just shy of $4,000 for grieving families. Simply amazing! A special thanks to Chris and Eleni Bicos for donating the food from Gus’ BBQ! Since his wife had died, he had written a blog, which had suddenly, unexpectedly, connected him to widows and widowers around the world. In the course of composing entries and corresponding with this new community, he realized, in addition to inappropriately simplifying pain, platitudes offer no view of life beyond grief. Matt wanted to add something to the grief refrain. He wanted to say this, right now, is the worst, but you can make it. Matt himself was starting to make it, and as he prepared to go back to work, he considered the four thousand dollars remaining from donations family, friends and strangers had given him since his wife’s death. The money couldn’t fix what had happened, but it had allowed him time and space to focus on his new daughter. He had started believing that his life would move forward, and in the relief of that revelation, Matt gave the money away, in the form of several small grants. The Liz Logelin Foundation was born. Recently, the foundation received a letter from a former grant recipient. The letter thanked the foundation for its help, then explained the family had turned a corner, had a better year than expected. They included a donation so that another family might experience this same success. Matt says, and he launches into his vision for the foundation’s future: legal and financial consultation for young widows and widowers thrown into running a household alone. Checklists and practical resources to anchor the process. Sponsorships that send widows, widowers and their family members to camps and other places of community. Matt’s vision is one of support and empowerment, one that begins drawing the map to life after grief. In the new year, help the Liz Logelin Foundation and its community continue to grow. We have many exciting events planned for 2012 and we would love to see you at one or more of them. Bowl for Hope: March 10th at 7:30pm at Montrose Bowl in Los Angeles, CA. Clickhere for all the details and to purchase tickets. Minnesota Wild Game: April 7th at 7pm at Xcel Energy Center in St. Paul, MN. Clickhere for all the details and to purchase tickets. Run, Walk, Hope 5k + Maddy’s Mile Fun Run: June 9th at 9am at Minnehaha Park in Minneapolis, MN. Don’t forget you can always participate in the walk around the world no matter where you are. Celebration of Hope: September 22nd at Solera in Minneapolis, MN. Tickets available soon. Mark your calendars now! For the latest information and tickets find us ontwitter, facebook or check the website. This year families from cities across North America experienced the tragedy of loss. Thanks to you, they also experienced the gift of hope. The power of hope is incredible. As one family told us – your gift helped us to find the strength to journey on. Cheers to you and all that you made possible for grieving families this year! We simply cannot put into words how deeply we value your support. Have a wonderful and safe evening ringing in the new year. We can’t wait to see what we can accomplish together in 2012! On behalf of the families whose lives you’ve changed and the entire LLF – thank you.